The prolonged pain of this repetitive struggle will cause you to become slowly and stupidly angry until one day when it starts to rain, you will turn your head to the heavens and start wailing at the sky. No doubt, people will look at you and judge. Now, I’m not afraid of water (I have learned to use it every day to wash on the outside and hydrate on the inside), but I don’t however pour it over my fully-clothed body. Neither am I one of those people who looks great with wet hair (I am not vain to the point of avoiding a swim but I don’t want to look like I swam into work). Hats and cars are viable prospects but it’s harder to keep either of those in your bag. 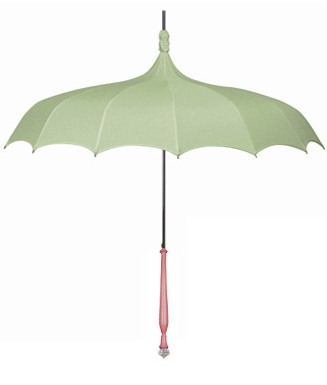 So an umbrella is a practical solution to our drizzly dilemma, designed to protect from unpredictable precipitation. Except it’s not quite as simple as that. The bumbershoot (yes, I know) leads us into a very vicious circle, sullied by Sod himself. Maybe you have a bargain brolly but it breaks at its mere exposure to the elements. So instead you invest in a premium parapluie, which withstands the wind but is lost at its mere exposure to a train (as you may know it is virtually impossible to remember a wet umbrella when leaving the train). If you don’t take public transport you probably have a car. And if you have a car then you don’t need an umbrella. So you’re left, either way in need of buying a new umbrella every second or third time it rains. Unless of course, for whatever reason, you have a golf umbrella. The king of rain protection, this bad boy will keep you, and half the street dry. Granted, it will never break, but you can’t keep it with you at all times. It’s amazing if you’re one of the people under it, but unfortunately, it can only really be used for golf; using this thing in the city is akin to running down the road with a sword. If it’s up, you take people’s eyes out, and if it’s down, you stab those behind you in the thigh. So as you can see, I can’t make up my mind. All my umbrellas have deserted me soon after purchase. Yet I keep going back for more. I obviously don’t know what’s good for me. Maybe I should just break it off. Maybe I’d be better off soaked. 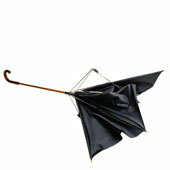 This entry was posted on Saturday, February 4th, 2012 at 02:58	and tagged with brolly, bumbershoot, parapluie, Pictorial Depiction of Umbrella Dilemma, Rain, soaked, Umbrella and posted in Ca depend!, humor. You can follow any responses to this entry through the RSS 2.0 feed. I’ve never liked them. Maybe It’s because I’ve never been able to do a drawing of a conservative looking umbrella — they always turn out looking funky like the first picture seen above. I also like to walk (ok, march) down the street hands free. I never sneer at others holding umbrellas, on the contrary! I still remember my elation when looking down upon a sea of umbrellas in a Notinghill market street; I was wearing my hoodie. During a really heavy down-pour, however, I will (a) run like the dickens, (b) dip into a bar, or (c) ask a madame/mademoiselle if i could hold her umbrella for her thus keeping myself dry too. Good one, Denise. Love it when you add references. I love the small, practical, black, strong umbrella and purchased one some years back but, due to fear of losing it, I protect it to the point of obsession so only use it when I am visiting friends, with the sure knowledge that should I forget it, they will keep it safe until I can retreive it. Investment in a small plastic bag which will hold my wet umbrella in my handbag without saturating the contents therein has worked but is not a guarantee of it’s safety. I did invest in a protective raincoat which, though not pretty, is very practical and not so easy to lose. it cost a little more than a good umbrella but does the job and doesn’t cause a hazard to my fellow predestrians. Admittedly only wear it when the sun is in hibernation for the day. 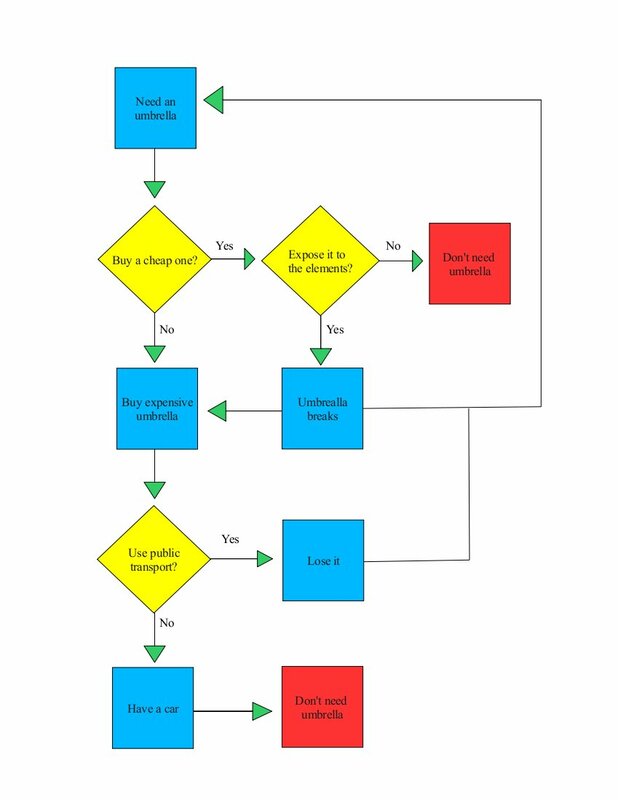 Hope this is helpful to your dilemma.